Having been tipped by everyone from BBC 1XTRA, THE GUARDIAN, THE INDEPENDENT, TIME OUT, THE METRO, DJ MK & SHORTEE BLITZ, DJ 279, CHARLIE SLOTH and many of his peers as one to watch for 2010, SKANDAL delivers this his first single from forthcoming mixtape ‘HUNGER PAINS VOL 2’. Not one to sit about, actually he literally can’t, SKANDAL soon followed up the first ‘Hunger Pains’ mixtape with the monstrous ‘Kill Em With The Flow’ Remix that brought two giants of their realms together, P-MONEY and KLASHNEKOFF. The track didn’t just tear the roof off, it blew it away soon after it was given it’s first play on MISTA JAM’S RADIO 1 show!! 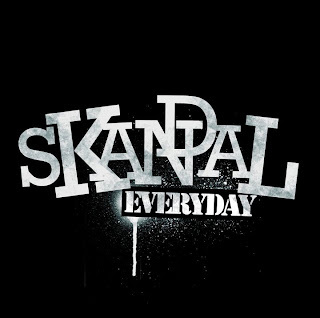 ‘EVERYDAY’ produced by JON PHONICS and featuring SB.TV F64 champ BLACK THE RIPPER, will be released on 19TH JULY on iTUNES, AMAZON, 7 DIGITAL and all other good digital retailers. HUNGER PAINS VOL 2 is out SUMMER 2010!!! !